CSIS held a public forum to discuss long-term strategies for improving maternal and child health at Barnard College in New York, in preparation for the roll-out of the completed Report of the CSIS Commission on Smart Global Health Policy, A Healthier, Safer, and More Prosperous World. The forum brought together five Commissioners, including, Debora Spar, Helene Gayle, Representative Kay Granger, Joe Rospars and Pat Mitchell—combining expertise in medicine, mass communications, new media and policy. 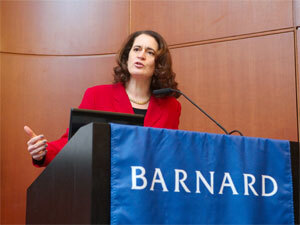 Debora Spar, President of Barnard College, opened the discussion by explaining the Commission’s specific focus on women and girls. “…as the Commission started to dig deeper into this huge issue of global health, the more specific issues of maternal and child health rose pretty swiftly to the top of the Commission’s agenda.” She continued by saying that women should have the resources, knowledge and ability to control their reproductive lives. Helene Gayle, President of CARE and cochair of the CSIS Commission, discussed the leadership role of the United States and the three reasons why the U.S. should take an active and expansive role in global health. She highlighted the “smart power” component of global health and noted that these investments are integral to our own strategic interests. Second, she said “the world is counting on us“; the world has made remarkable progress in fighting AIDS, Malaria, and many are now free from the burdens of polio and measles. Lastly, investing in global health is important because “it’s the right thing to do,” and as a blessed nation, the U.S. cannot continue to develop own human capacity if we watch millions suffer and do nothing. Media experts Joe Rospars, Cofounder of BlueStateDigital and former New Media Director for the Obama Campaign, and Pat Mitchell, President of the Paley Center for Media, provided input by placing the topic of Maternal and Child Health in the context of mass media and online community building.